A study conducted in C. elegans nematode roundworms may lead to improved treatment of a rare human genetic disorder that causes severe neurological symptoms leading to death in early childhood. 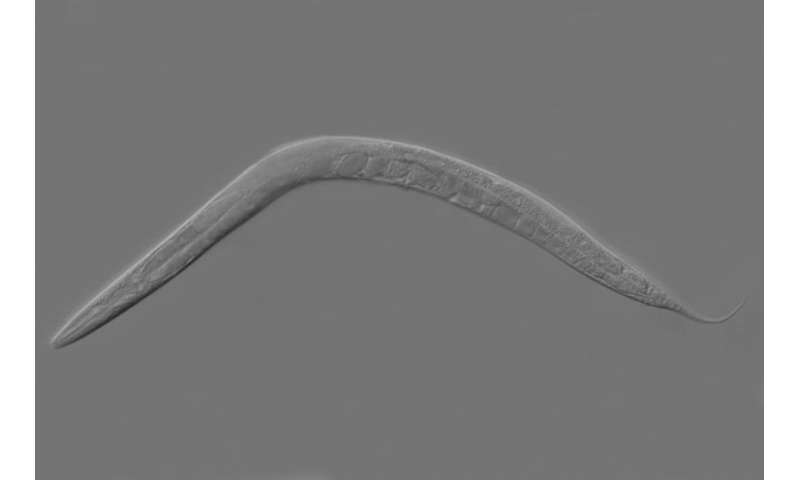 In their report published in Nature Chemical Biology, two Massachusetts General Hospital (MGH) investigators describe finding that C. elegans can acquire the molybdenum cofactor (Moco) - a molecule essential to the function of essential enzymes—by consuming E.coli bacteria, the first evidence that Moco can be transferred between species. The investigators also identified the metabolic pathway that is responsible for the symptoms observed in Moco deficiency. "Until now, Moco was thought to be too unstable to be trafficked between cells and tissues, much less between organisms separated by a billion years of evolution," says lead author Kurt Warnhoff, Ph.D., MGH Molecular Biology. "But we found the interaction between these species to be quite robust. Bacteria isolated from rotting fruit—a typical C. elegans habitat—were able to supply Moco to the nematodes. This ability of C. elegans to extract Moco from its microbiome is intriguing and offers hope that we might be able to exploit similar systems to deliver mature Moco to patients with Moco deficiency." Healthy animals from C. elegans to humans can synthesize Moco within their bodies. In mutant C. elegans that cannot synthesize Moco, normal development halts and the animals die unless fed a bacterial diet featuring the coenzyme, paralleling the effects of Moco deficiency in humans. Using C. elegans genetics to investigate how Moco deficiency leads to death, Warnhoff and senior author Gary Ruvkun, Ph.D., also of MGH Molecular Biology, identified the pathway that normally breaks down the sulfur-containing amino acids methionine and cysteine as the culprit. A byproduct of that breakdown is the release of sulfite, a toxin used as a preservative in many foods, and the researchers found that lack of Moco inactivates the SUOX enzyme that normally detoxifies sulfite, leading to death of the nematodes.